The SPLITMUX® 4K HDMI Quad Screen Multiviewer allows you to simultaneously display real-time video from four different sources on a single HDMI Ultra-HD 4Kx2K monitor. It is capable of displaying the video signals in quad, PiP, full, or custom mode. In quad and full screen display modes, the multiviewer supports 4K, 2K, 1080p, and 2560x1600 output resolutions. 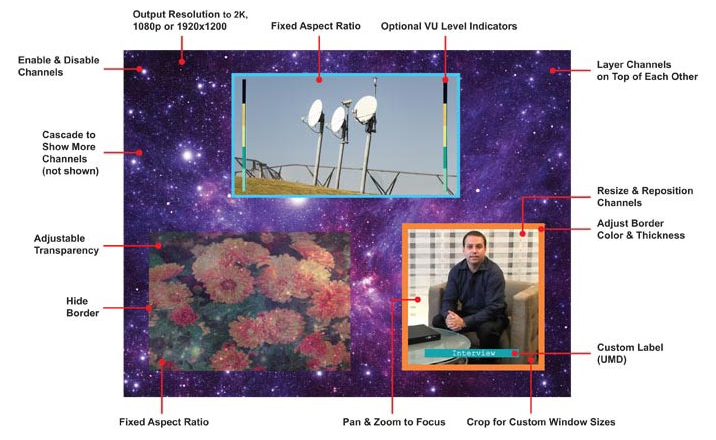 In picture-in-picture and custom display modes, it supports 2K, 1080p, and 1920x1200 output resolutions. Also known as: 4K quad screen splitter, 4Kx2K multiviewer, video quad display, quad monitor, four video sources displayed on one monitor. Quad & full screen display modes with 4K, 2K, 1080p, & 2560x1600 output resolutions. 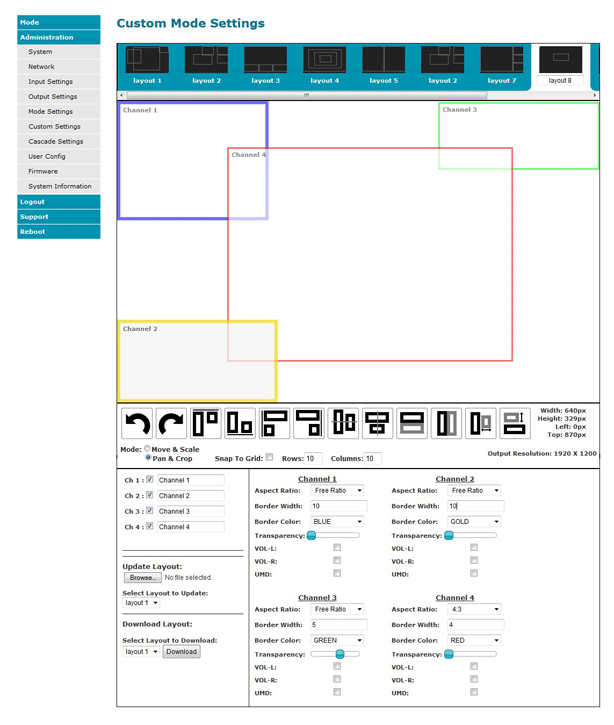 Picture-in-picture & custom display modes with 2K, 1080p, & 1920x1200 output resolutions. Maintain input aspect ratio if desired-no stretching necessary. Inputs: 2K resolution 2048x1080, HDTV resolutions to 1080p and computer resolutions to 1920x1200. Quad and Full mode: Ultra-HD 4Kx2K resolutions to 3840x2160 (60Hz) and 4096x2160 (60Hz), 2K resolution 2048x1080, HDTV resolutions to 1080p, and computer resolutions to 2560x1600. PiP and Custom mode: 2K resolution 2048x1080, HDTV resolutions to 1080p and computer resolutions to 1920x1200. Four-channel mixing stereo with 16-, 20-, or 24-bit uncompressed PCM audio. Fluid, real-time video performance with up to 60 frames per second (fps) in all four quadrants. 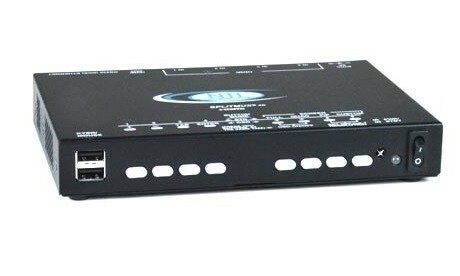 Control the multiviewer through Ethernet, RS232 serial port, on screen display (OSD), front panel buttons, or IR remote. 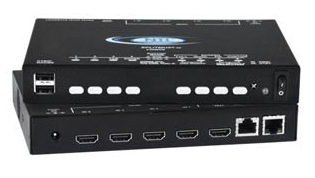 Supports HDMI devices, such as DVD/Blu-ray players, satellite receivers and HDTV tuners. Compatible with 21:9 UltraWide monitors. Supports HTTP REST API to configure SPLITMUX-4K-4RT with response in JSON format. Operating temperature: 32°F to 113°F (0°C to 45°C). Storage temperature: -22°F to 140°F (-30°C to 60°C). SPLITMUX-4K-4RT and ST-C64K-300 will work together at resolutions up to 3840x2160 @ 30Hz. Use hotkey commands or hotmouse commands to select display mode and to select port.